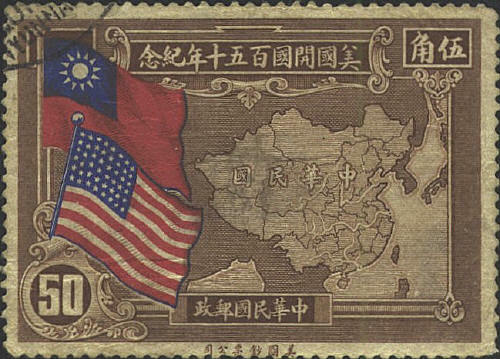 To commemorate the 150th anniversary of the Constitution of the United States China issued a set of four stamps with a map of China and the flags of China and the United States. Taiwan can be seen off the Southwest coast of China. It is not shaded like China. 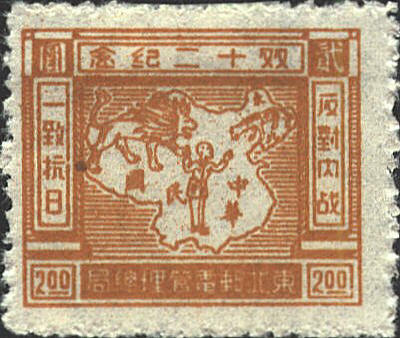 The stamp from the Northeast China region shows a lion and hyena snarling at each other with Chiang Kai-shek in the foreground. It was issued by the Northeast Liberation Area to mark the 10th anniversary of the arrest of Chiang Kai-shek by Nationalist subordinates or Communist subordinates at Sian. He was released on the condition that he join with Koumintang forces against the Japanese. Taiwan had been in the hand of the Japanese from the end of the First Sino-Japanese War in 1895 to the end of World War II in 1945. 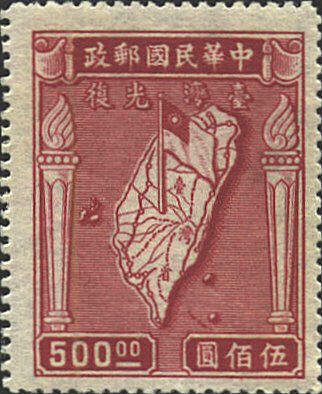 The stamp was issued by the united China to mark the second anniversary of the "resoration of Taiwan to China."